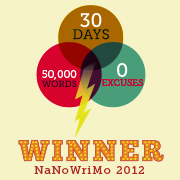 Jonny Napalm's Burn Center: NANOWRIMO Day 29.. So here we are at the end of November and NANOWRIMO is almost done. How'd I do? Pretty good if I do say so myself. While I didn't have my 50k words set to go when they opened up finalization on Monday, I did manage to get there today. I'm pretty proud of myself to be honest. Now I just need to keep up the writing habit. Now you may be asking where my story is at...and the funny thing is it's just getting started. When I started this project my impulse when I first started writing was to go with a series of short stories all in a collective world to try and establish this environment that I wanted to write in. Then I actually started writing the Characters, and the environment, and some of the events going on and I discovered that it wasn't going to be a series of short stories...unless I decided to make them all 100 pages. So I now have a story I'm really enjoying writing, and want to re-visit. But I'm feeling like writing something else for a bit. And I feel like I can justify working on something else now that I don't have the finish of NANO looming. Honestly I'm just looking forward to writing some more stuff. I don't know if I'll ever manage enough material to publish or anything, but the fact that I finally feel like I got past my internal editor? That's feeling like a step in the right direction. I'm thinking I could use a bit more structure on my next big writing project though instead of letting the story grow on it's own like this one did. I'll need to revisit some old writing lessons about plotlines, character development and stuff like that. A fantastic writer named Frea O'Scanlin (at least that's what she's told me to call her), pointed out some web based lessons on Creative Writing by Brandon Sanderson. I'm likely going to be spending the next week watching those and seeing what I can build with his advice. Between him and Michael Stackpoles 'The Secrets' a wonderful podcast and newsletter all about writing, I think I'll be able to do some more to develop this habit into something more. I hope anyhow. Hope your days are as full as you want them to be. With all the joy and good fortune you can find.